Note: Javeleon will no longer be available for download as a standalone product. We are thrilled to be joining the ZeroTurnaround team, and excited to dive right in and help integrate the Javeleon technology with the JRebel product line, said Dr. Gregersen. We have admired the ZeroTurnaround success story for years, and we believe our involvement will positively impact ZeroTurnaround's future growth. Software is eating the world and ZeroTurnaround helps the software community develop and deliver better code faster and with less downtime. Javeleon let's you see changes to code instantly in a running Java application. Simply save your files and see the magic take place right in front of you. Once you have experienced coding in Java with Javeleon you will ask yourself how you could live without it. Javeleon is a little JVM plug-in called a Java agent that hooks into your application seamlessly while enabling changes to classes and resources while you develop. We're a strong team with lot's of Java experience and we're ready to help you and your team save valuable time. Try out this amazing product for free! Javeleon eliminates the need for restarting Java applications during development. Our technolgy builds on 10 man-years of research. Javeleon saves you valuable time and boosts productivity significantly by allowing you to keep focusing on your project without constant interuption. No waiting. Constant momentum. Stay focused. November 5th 2012: Javeleon 3.0.1 RC just released. Now with "Reload on Save" for NetBeans platform applications. Read more about this new support here. More support for CDI (Weld). Adding/removing/changing CDI annotations is now supported. 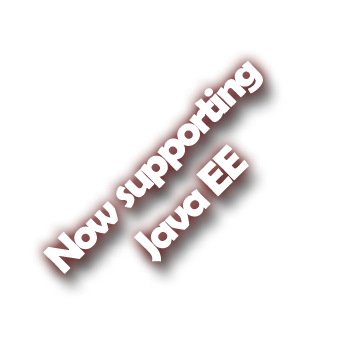 Fixed bug that prevented multi module Java EE projects from working correctly. Now simply add a javeleon.xml file for each module and you're ready to reload classes regardless of which module they belong to. Read more on how to setup javeleon.xml here. Did you notice that new support button? Yes, at Javeleon we actually care about our customers. We think you should be able to get in touch with us as easy a pressing a button. So that's why we added that blue button that you see to the right. We encourage you to try out our new support option. We always respond quickly to your questions and/or feedback, and we encourace you to try out our support as part of your evaluation of Javeleon. Remember, we're here to save you time, so don't waste time trying to figure out why you end up having some kind of weird issue. Simple ask us and we'll investigate and provide you with a timely answer to whatever question you may have. Javeleon has an unmatched feature set providing for full class reloading capabilities, with no exceptions. Find out more on the feature page. At Javeleon we strive towards a world where the current re-deployment nightmare has turned into a scary tale from the past. Check out our company vision and tell us what you think. See for yourself how Javeleon can save you a ton of time at the screencast below. You’ll be amazed how much time you waste when you're coding. I've used Javeleon at countless NetBeans Platform trainings. You start up your app once, then reload any modules when you've made changes in them. Incredibly fast development cycle. ... students have used it and loved it, been amazed, frankly. We loose no more time to restart an application just to verify a layout or to check translated texts. We use the saved time to implement new features and to improve the quality. By dynamically reloading classes, developers have been able to make more efficient use of their time for development and testing of the application. Designed and built using Twitter Bootstrap, licensed under the Apache License v2.0, icons from Glyphicons Free, licensed under CC BY 3.0.